In 2016, at the OFN Conference in Atlanta, Vicky Stein, Vice President of Strategic Partnerships at Community Reinvestment Fund, USA, and Megan Teare, Senior Vice President, Wells Fargo Community Lending and Investment, held what was the first networking event for women in the CDFI Industry. A last minute addition to the agenda, the concept was simple – women in our industry are looking for ways to connect, share, and learn from each other. The response was overwhelming and exciting. Since the first gathering, momentum for formalizing a network of women in the CDFI industry has grown, with a second event at the Small Business Finance Forum in Chicago, a challenge for women to engage and coordinate networking events around the country, and the second annual gathering set for Tuesday, September 27th from 11 am – 12 pm at the OFN Conference in Washington, D.C. In addition to the event at the Conference, OFN is launching a new community and learning platform, and the CDFI women’s network will serve as a beta tester for the platform. With this new platform, and the kind of response the co-founders have received, the network is off and running. CDFI Connect sat down with the co-founders to learn more about the impetus behind this growing network and what they hope it will become. How did the idea for a women’s network come about? (Vicky) It all started when Megan was relocating from Washington, D.C., to the Twin Cities. Lionel Romain, a wonderful mutual friend who works for CEDAC, said “Megan, you should meet my friend Vicky, she works with a Minneapolis-based CDFI and can introduce you to other people in the area.” This notion of how important a network can be in our industry not just when you are starting out but throughout your career is what got us thinking about a CDFI women’s network. As our personal and professional friendship grew we talked about how formalizing our network could benefit the industry. (Megan) We didn’t want to create an organization right away; we wanted to have a meeting and gauge interest. Donna (Fabiani, OFN) very kindly put it on the agenda for the last morning at 7:30am, and we put a little blurb together, and we were really bowled over because we had 75-80 women in the room. It was standing room only, and we heard from lots of women who said that they would have come if they hadn’t left the conference already. So we had a germ of an idea and were really encouraged and inspired by the response we received at the Conference. In the last year, we have been working to formalize an infrastructure for this organization, including finding a platform to communicate and build out the network. How is the group forming, are there multiple leaders? (Megan) We have seen a steady stream of people coming forward and expressing their interest in helping develop this network. There is a core group of women sending us ideas and “raising their hands”. As we head to the 2017 Conference, we are working on formalizing a governance structure, how we will work with OFN to test their new online community building platform, and thinking how to put volunteers to work! We get countless emails from women asking to be added to our database so they can receive updates on our progress. We know there is a lot of untapped interest and expect more women will join as we create an online platform that makes it easier to connect. (Vicky) I would add that for many of us this is our third job—we have day jobs, we sit on boards - but we’ve still had several women show up and say “what can I do?” Two women collected all the business cards at the first meeting in Atlanta and had their assistant create a list of members which became the foundation of our database. Hannah Vargason of Natural Capital Investment Fund helped to set up the Chicago event at the Small Business Finance Forum. So we’ve had a lot of help along the way, but it has really been ad hoc so far. Now we need to take all the interest and great ideas about leadership and mentoring and turn them into something bigger. (Megan) We certainly don’t want it to be just the two of us. We want other people to help shape the vision and direction of this group. What is happening between now and the Conference? (Megan) At the meetup in Chicago, a few women jumped up and offered to host a local gathering, so we’re building on that momentum and have issued a challenge to the network to pull together local events around the country before the OFN Conference. 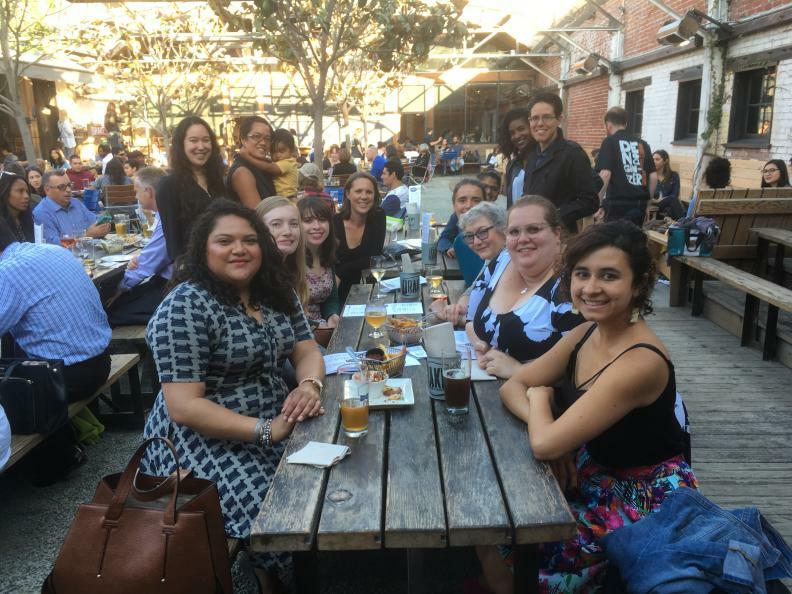 Close to 40 women attended an event in Washington, DC, on August 17th, and a similar event took place recently in Oakland. Several other gatherings are being in planned in places like Philadelphia and Minneapolis. We hope more come together between now and September when we meet at the Conference. What are you calling the group? (Megan) The working name is CDFI Women’s Network but we’re also putting out a challenge to our members to come up with a catchy name. What are you hoping the online platform will be able to provide for the network? Hopefully there will be a commitment to being timely, responsive, and engaged with the community. (Megan) It will be an information request platform. Not just a place for questions, but where articles, training resources, etc. are shared. We hope people think about the network when they come across new information. Women seem to be particularly good at networking. I’ve always said, going back to the story of how this idea got started, Vicky has been so helpful to me and I have been able to be helpful to her. We both network a lot and really appreciate the resources and friendship in each other and in our broader network. Vicky sums it up well when she says, “We should always be willing to take the call,” meaning if she connects someone to me that I be willing to take the time to speak with that person. That’s the essence of our relationship, and we want to broaden that and institutionalize it. What can you tease about the event in D.C.? (Megan) We are slotted for 11:00am-12:00pm, Wednesday, September 27. We will talk about our new communications platform and what we hope for the group going forward. (Vicky) Yes, we will talk about how the network is taking shape and how we will use the new online platform as an organizational tool. We are hoping people will be able to report back on the local events that have taken place so far. We need to start to really put together a structure and delegate responsibilities because two people can’t do all of this. And we’ll vote on a name! (Vicky) While OFN’s Conference is wonderful and energizing, we don’t want to limit member interaction to just the Conference. We want this network available to people who can’t come to the Conference, and to be available all year round, and that’s why this communications platform is so important. Sign up now to join the network and connect to one of the upcoming networking events, or plan your own—the event could be a happy hour in your location, or a conference call for a peer group (for example, loan officers at rural CDFIs), or a book club meeting. Use your imagination and be prepared to report in at the OFN Conference! While this is not a competition per se—or even a requirement—there will be prizes! If you have questions about the women’s network, contact Vicky or Megan.